Low industry cross-selling rates indicate that financial professionals don’t often know whom to call or why. Train your financial professionals in real-time on how to recognize relevant sales opportunities through the RightBRIDGE® reason text. Advisors will see how factors such as age, income, investment experience, risk tolerance, tax bracket, years until retirement, etc. will score to make an opportunity a relevant suggestion for a client. 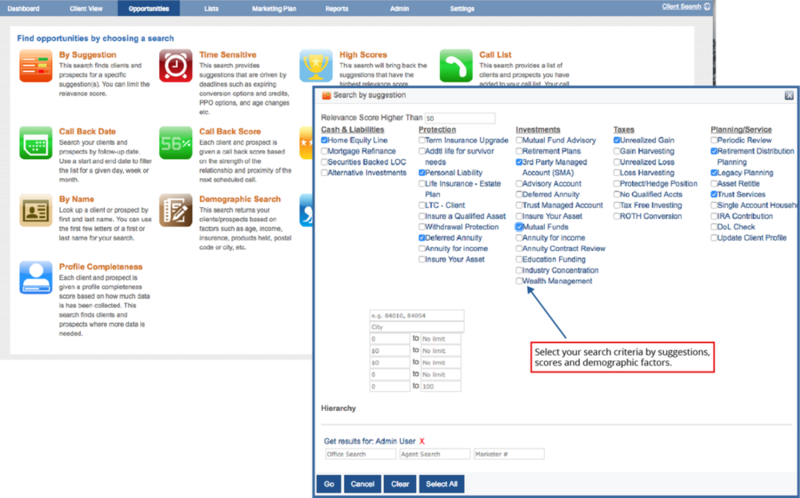 The system returns all of the clients that meet the criteria selected in the Quick Search in the form of a call list. This list is complete with all the information on each opportunity. Opportunity Reports can also be printed from the system. Through the Opportunities module, a financial professional can easily rank and sort through the best sales opportunities in his/her book of business and determine how to best follow-up.